US, 2004, 97 minutes, Colour. Johnny Messner, Ka Dee Strickland, Matthew Marsden, Nicholas Gonzalez, Eugene Byrd, Karl Yune, Morris Chestnut. The original Anaconda was a popular show, generally ridiculed by the critics. This follow-up, not a sequel, received even less affirmation, including a Razzie nomination for worst film. The screenplay is the kind that most people could sit down and write if they were given a framework for a matinee adventure. The setting is Borneo and opens with scenes of local tribesmen and the pursuit by an Anaconda – and destruction and devouring. The scene transfers to New York, explorers putting in a plug for finding an orchid in Borneo that flowers for only two weeks every seven years and whose contents contain a drug that prolongs life – a new, commercial version of the Fountain of Life. At first reluctant, the board is persuaded and an expedition set up. The expedition is led by a British scientist who also has a team of doctors and scientists with him. Also present is the executive who was not enthusiastic about the project as well and is the entrepreneur who promoted it. However, it is the rainy season and boats are not willing to go upriver – but a man is found, Johnny Messner, who was a special Ops operator and he and his associate do a financial bargain. What happens is fairly predictable, difficulties during the voyage on the rickety boat, the opposing official falling overboard and being threatened by a crocodile which the captain of the boat fights and stabs… In the meantime, there is the expected squabbling amongst all the characters. When the boat goes over a waterfall, it smashes to pieces, and when what is left is gathered up, there is a trek through the jungle to rendezvous with another boat (whose captain is swallowed by an Anaconda). During the crossing of a river, a flirtatious young doctor is devoured by an Anaconda. The leader of the expedition interprets the size of the anacondas, whose diet includes the blood orchids, as indicating that the essence of the flower has life-giving power. The rest of the expedition offers the expected terrors, poisonous spiders causing paralysis, more anacondas on their way to a breeding ground, all kinds of dangers, all kinds of frights, all kinds of taking of responsibility and the majority ruling. The head scientist then manifests his obsession, taking the raft that they have built, stranding the others. Once again, they go through the jungle, not without quite a lot of terrors, to encounter the scientist, the flowers in the pool for breeding, one of the doctor’s assistants manifesting determination and force to get the flowers, rescued, the scientist – of course – falling into the pool and being devoured. And so, the travellers valuing life more than money take the raft and travel downriver. 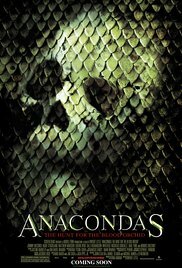 There were several other films with Anaconda in the title but not related.